Runner Rocky is not only covering and featuring running. It covers the whole sports community as well. 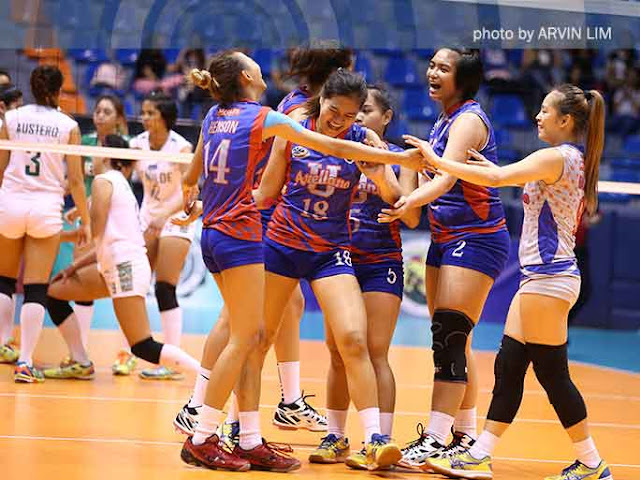 This time, let's take a look into the favorite female sports, the volleyball. Just like basketball, volleyball is already a superstar's game in different schools and campuses. It already gave rise to the different volleyball athletes that we admire today! Therefore today, let's get to know six of the so-called "Volleyball Princesses!" Even as volleyball queen Alyssa Valdez is in Thailand, the country is not lacking firepower and star power in the local volleyball scene. With the rise of the sport in the country, new talents continue to emerge in the collegiate leagues, regaling us with their skills and charisma, and showing us they have what it takes to be torchbearers of Philippine volleyball. 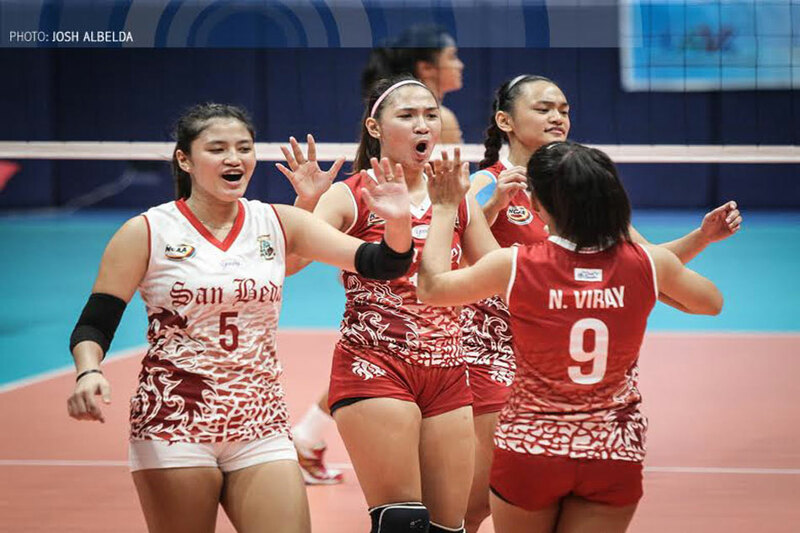 In the NCAA, which will have its semifinal volleyball matches aired on S+A starting this Tuesday (January 31) with live streaming on sports.abs-cbn.com, six volleybelles have stood out for the excellence, hard work, and teamwork they have displayed all season. Meet the six NCAA aces that have been making the crowd go “ohhh” and “ahhh” with their awesome skills, charm, and heart on the court. Who says San Sebastian is a one-woman show? While superstar Grethcel Soltones leads the Lady Stags’ top-notch offense, Alyssa Eroa is the anchor of their defense and the one coach Roger Gorayeb and the team turns to in keeping the ball off the floor. She may be diminutive in stature but she is a giant in digging and receiving as one of the best liberos the league has seen for quite a while. Off the court, she is also a good role model, as she takes her studies seriously to protect her scholarship. 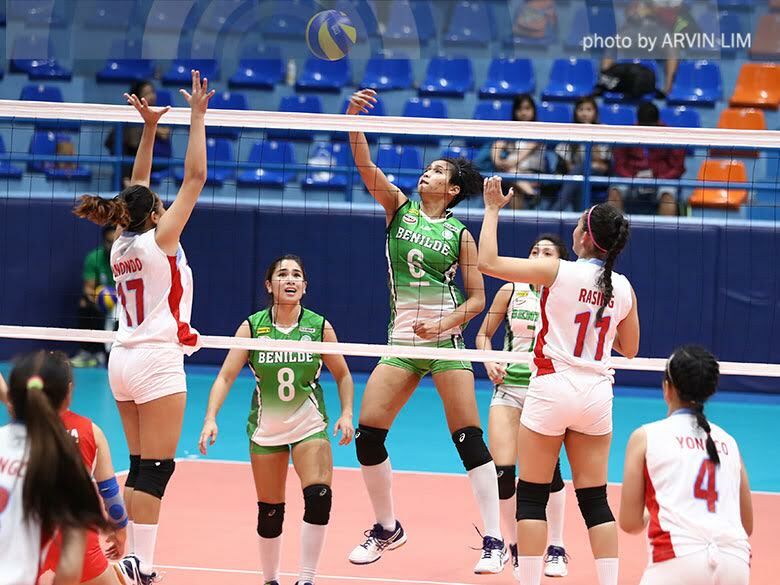 The towering Ces Racracquin almost single-handedly towed the San Beda Lady Red Spikers to the stepladder semifinals when they outlasted an upset-hunting Mapua Lady Cardinals. The hard-hitting ace fired off 16 points, commandeering the team during the clutch moments of the fifth set. 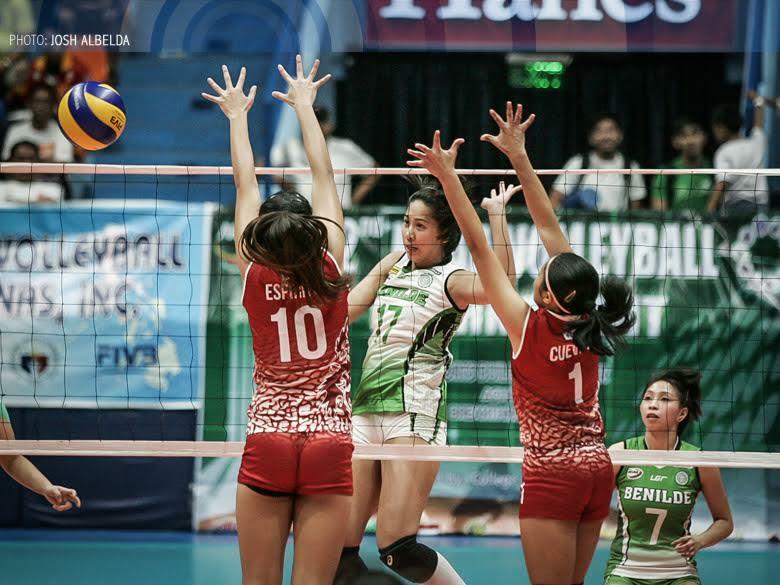 During the course of the season, Racracquin has shown that she is what Lady Red Spikers needed for that extra jolt of energy one thundering spike after another. She also likes to put on a show for fans even before the match, as she likes to break into random dances during warm ups. Jovielyn Prado (18) is the vital cog that makes the Lady Chiefs' machine run as they try to recover their lost diadem this season. AU takes pride in its balanced attack. The scoring duties are divided between team captain Rialen Sante, the towering Andrea Marzan, and open-hitter Jovielyn Prado. 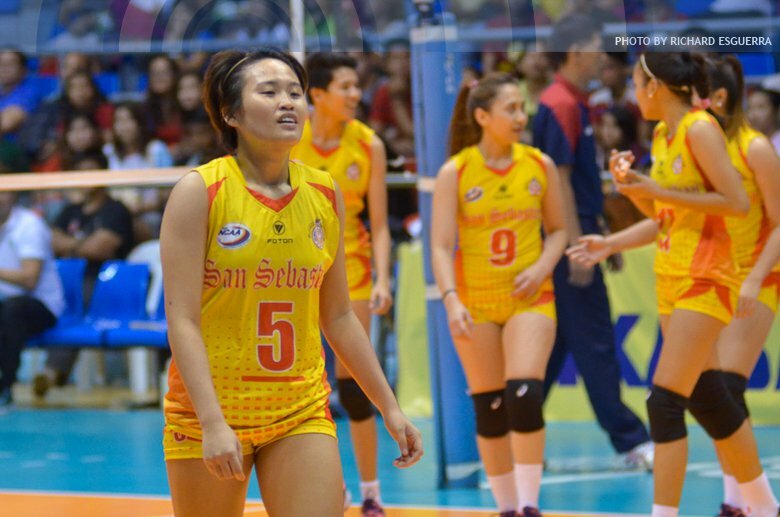 Prado’s star shines the brightest in leading the Lady Chiefs, being their go-to scorer when in dire need. She has been their best open-hitter and probably holds that distinction in the league if not for someone named Grethcel Soltones. Off and on the floor, Prado has been called shy, never domineering. Instead, she wants to lead by example, which she does very well evidently. Jeanette Panaga (6) is the NCAA's leading scorer this season and has been named as Best Blocker twice already with a Finals MVP for Season 91 to boot. Jeanette Panaga has come a long way for defending champions College of St. Benilde, leading them to the top 2 of the standings as the program continues to be resurgent following its surprise championship win last season. Panaga has shown the abilities of a born scorer as she torches the nets and pummels the hardcourt for 17 points a game, to lead the whole league. Panaga is also being looked upon by the entire squad to carry them to a successful title defense, which is looking like a rematch with the San Sebastian Lady Stags and Soltones. To her credit, she has been named Best Blocker twice, Best Spiker, and rewarded with the Finals MVP last season for her herculean efforts in denying Soltones and the Stags. Sophomore middle Ranya Musa has provided College of St. Benilde the solid support it needs for their star, Jeanette Panaga. She may just be a sophomore, but Musa has more than opened the eyes of everyone who have seen her serve as the first line of defense for the Lady Blazers as its middle blocker. The potential to be a devastating presence on the court is already there for Musa, tapping into it is a different matter. With the stakes higher than ever, the Lady Blazers may just have enough help around Jeanette Panaga thanks to Musa’s offense and defense for a back-to-back title romp. Musa started late in volleyball. If Mike Carino never discovered the 5’10” middle blocker, she would’ve pursued modeling instead. Grethcel Soltones has been lording all over the competition and wants to punctuate her college career with a championship. With all her accomplishments, Soltones has shown that she is ready to be a queen as she has been lording it over the NCAA since she got her star turn for the Lady Stags. The perennial MVP favorite is norming a shade over 16 points a game, but the graduating senior looks for a proper send off to her illustrious college career in the only way possible: winning a title. While she is a fierce competitor, Grethcel’s playful demeanor has endeared her not only to fellow players but also to fans who can see her joke around during warm-ups. She’s also a very supportive friend who can be seen watching the games and cheering for the likes of her “ate” Alyssa Valdez. Get to know more about the rising volleyball stars of the NCAA on S+A’s airing of the Men’s and Women’s Volleyball Final Four starting this Tuesday (January 31) with the Women’s Final Four going on air after the coverage of the Men’s Volleyball Final Four tussle, that starts at 11:30am, with the defending champions College of St. Benilde Lady Blazers bannered by Jeanette Panaga facing off against Ces Racracquin and the San Beda Lady Red Spikers at 4pm on S+A right. For more news, features, and live streaming of the semifinal matches, visit sports.abs-cbn.com or follow @ABSCBNSports on Twitter and Facebook. Catch the replays on S+A and S+A HD.